Villagers in the region are largely unaware of who the candidates contesting are or what they have promised. However, they believe their idea of 'development' is different from the government's. The Jan Manch (people's gathering) organised by the banned CPI (Maoists) group on November 4 to protest the elections in Potali village in Dantewada. 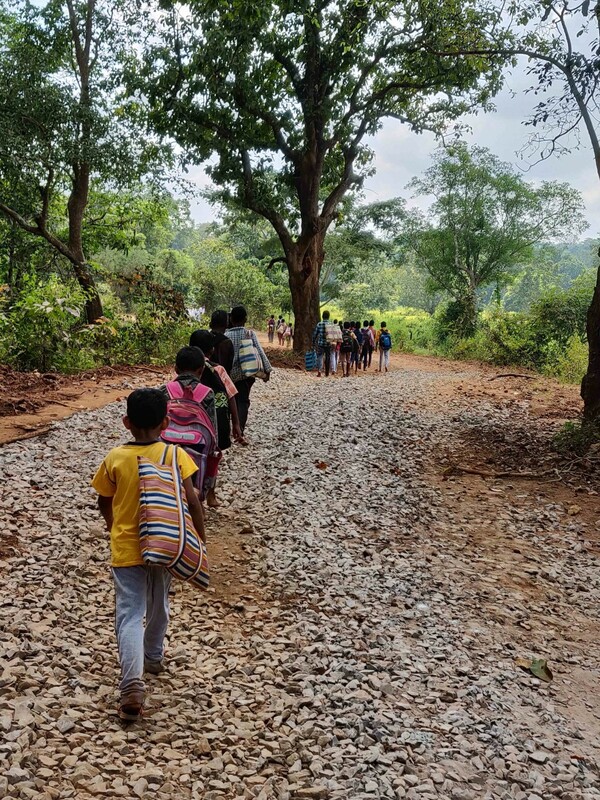 Nilawaya (Dantewada, Chhattisgarh): Under the blazing sun, a group of 35 boys, between the ages of six and 11, march on foot in a singular, almost regimented line. They are returning home from their residential school, 20 km away, after three months, for a week-long Diwali vacation. These children are from Nilawaya and nine other neighbouring villages, deep inside the forest, 49 km west of Dantewada district. The eldest of them leads the pack, cautiously inspecting the stony pathway and looking out for any ambush material laid down by the armed rebels. The others follow in his footsteps, meticulously. Around 35 children walk along the route to Nilawaya village where a DD news cameraperson and three DRG men were killed on October 30. It had been only four days since four people – three District Reserve Guards (DRG) men and one video journalist from the government-run Doordarshan news – were killed in a well-planned ambush set up near Nilawaya village. But for these children, dodging death is an everyday affair. So is the presence of various wings of the armed rebels in the villages in the remote forest regions of Dantewada, in the south Bastar region of Chhattisgarh. Nilawaya, a sleepy, medium-sized village with 159 houses (according to village records and the 2011 Census) made headlines because of the October 30 Naxal ambush just two km from the village. While the attack isn’t new for this region, the death of a reporter became a tipping point for outrage – the state, human rights activists and the legal fraternity condemned the Naxals for this dastardly attack. The three-member Doordarshan team which included Achyutananda Sahu had travelled on motorbikes, surrounded by armed policemen from all sides, to shoot a documentary-length video story on the different aspects of “development” in south Bastar, an area acutely affected by the left-wing extremism. People in Nilawaya have not exercised their voting rights for the past 13 years. Neither the sitting MLA from the Congress party nor the other candidates have managed to enter this region, fearing backlash from the Naxals. But this year, as a first step towards “inclusion and political participation”, the Election Commission decided to set up a polling booth inside the village. The tree bore four bullets exchanged between the Naxals and CRPF men on October 30. Four persons including a DD news cameraperson were killed in the attack. The Doordarshan reporters’ team was in the village to shoot at the spot where the booth was set up. But as the team approached the roadway to Nilawaya, People’s Liberation Guerilla (PLG) members, allegedly hiding in the trenches dug up nearby, opened fire, killing four people. The attack, as the Naxals have “clarified”, was not against the journalist but rather he was “collateral damage” in the long-standing confrontation between the state and the left-wing extremists. Development is a contentious word in this region. For children who change several modes of transport to get from one place to the other, travelling halfway by bus or by hitching rides with strangers and the other half on foot, this word makes little sense. There is no sign of primary health centres in nine villages spread across 20 km. Most child births take place within the village, and several women have died because of birth- related complications. Schools have not seen teachers for several months. Children either drop out as early as in class two or three or have to travel 20 km to study at a nearby ashram school in Burgum village. Like schools, anganwadis for children below six are also missing from almost all the nine villages around Nilawaya. Children and women are evidently anaemic and look severely undernourished. But none of these concerns around survival make it into the contesting parties’ manifestoes. Villagers protest against the upcoming elections scheduled on November 12 in the Bastar region of Chhattisgarh. The public distribution system stores have long been deserted and villagers have to walk several kilometres to even access local stores for food grains and daily provisions. The villages are remote, cut-off from the world outside. Banners protesting the upcoming elections on November 12 are a common sight. Thick tree barks, deserted PDS blocks and schools have printed or handwritten messages stating: “Sarkar (government), go back”. But the state government has been aggressively pushing for concrete roads. The argument that sitting MLA Devati Karma makes is, “If roads reach villages, other services like schools and hospitals will follow too.” Other candidates – Communist Party of India’s Nanda Ram Sori and Bharatiya Janata Party’s Bhima Mandavi – too have mentioned the construction of roads as their priority, if elected. Devati Karma is the wife of Salwa Judum founder Mahendra Karma, who was killed in the 2013 Jeeram Ghati Maoist attack. Karma, known as the “Bastar Tiger”, was instrumental in starting the controversial anti-Maoist “armed civilian vigilante” movement, Salwa Judum, in 2005. Salwa Judum’s armed men were essentially tribals, mostly low-rung surrendered Naxals, who were accused of crushing the locals’ human rights and creating havoc in the region. Cases of rapes, deaths and loots have been reported from Bastar en masse in the past decade. The villagers here, however, are vehemently opposed to the state’s definition of development. “Humare paas na gaadi hai na ghoda, sadak humare kiss kaam ke? (We neither have an automobile or a horse, why do we need concrete roads? )” asks the sarpanch of one village. The villagers claim the entire focus on roads has been to further militarise the region. “Earlier it was Salwa Judum, now the vigilante group has manifested itself into an even more offensive District Reserve Guards (DRG). They come here, loot our ration, and ill- treat the villagers. Almost every house has at least one man or in some case even women arrested from our village. Nilawaya alone has seen over 49 arrests in the past three years,” a village elder told The Wire. The presence of armed CRPF men in Dantewada is palpable. Just between the Dantewada district headquarters and Nilawaya, there are two CRPF camps, each consisting of at least 300-350 personnel. There has been a proposal pending for approval to set up one more in the region. “Hence, the pressure to connect these villages with concrete roads is very high,” said another villager. The nine villages around Nilawaya – Revali, Burgam, Nahadi, Kakadi, Jabeli, Barrem, Chirmur, Soperas, and Gonderas – have around 50-70 houses each, belonging to the Gondi tribe. These villages have been in the clutches of the Naxals. The PLG, which comprises of heavily armed men, and the Sangam members, who are unarmed young men and women who mostly operate as couriers, are present in these villages in very high numbers. The Naxal cultural group Chetana Natya Mandli also operates from these villages and has made several local recruitments. 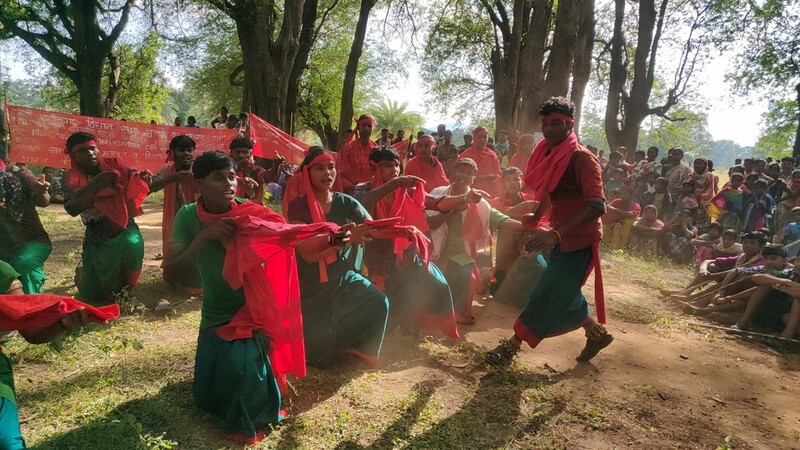 Members of Chetna Natya Mandli, a cultural wing of the banned CPI (Maoists) group, performs at Potali village in Dantewada. In the 2013 elections, of the 870 voters from the region, only four cast their votes. This year, the polling booth that was set up in the village for the first time has already been moved eight km away after the journalist died in the ambush. This year too, no party candidates have managed to reach these villages and most villagers are unaware of the various contenders. There are seven candidates in all in the election fray. But villagers only know of Karma, even if still unsure whether it is slain politician Mahendra Krama or his wife Devati Karma contesting from the constituency. 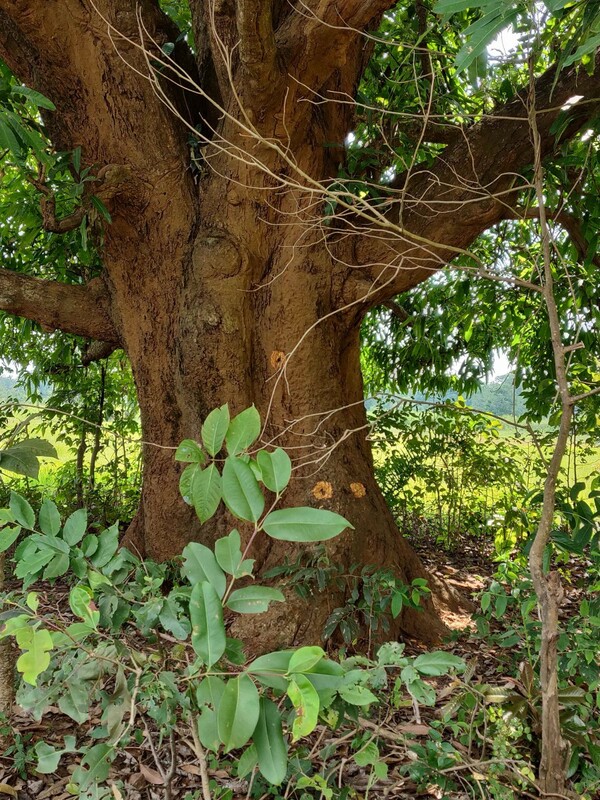 This reporter had travelled to Nilawaya on November 4 early morning along with three other local reporters – a correspondent with a state-based private news channel and two freelancer writers who have been working in the Bastar region for nearly a decade. Considering it is a difficult terrain, accessing villages in the interior without local help was not possible. On reaching the spot of attack, two teenage boys claiming to be from Nilawaya village spoke to the reporters in Gondi. 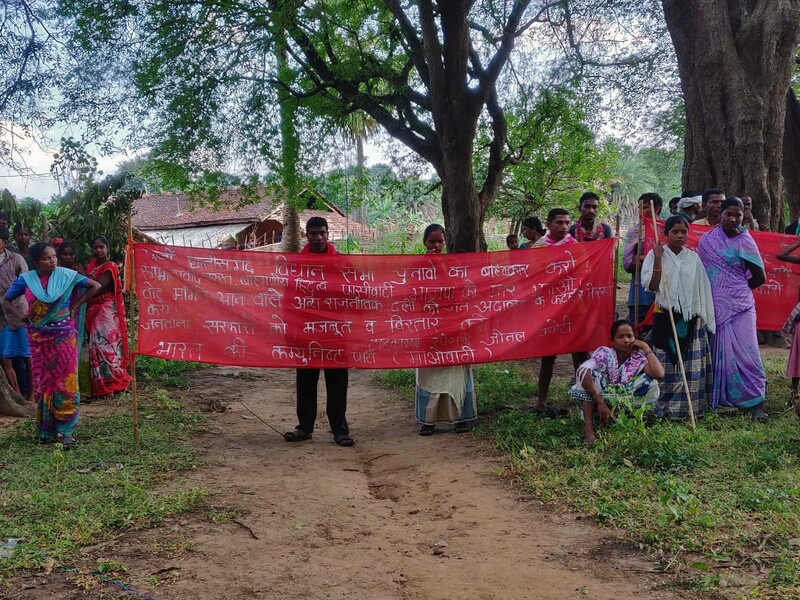 They claimed villagers had assembled two km away in the woods and wanted to express their reasons for boycotting the elections. As the team of reporters entered the forest, the situation changed. After a first few minutes bike ride into the thick forest, the two boys hopped of the bike only to be replaced by another two. This went on for next 20 km, till this reporter and others made it to a village that someone identified as “Potali gaon”, a village that is not marked on the Google Maps. Much of this 20-km journey was involuntary and the reporters had to follow the instructions given to them under fear of detention or physical harm. 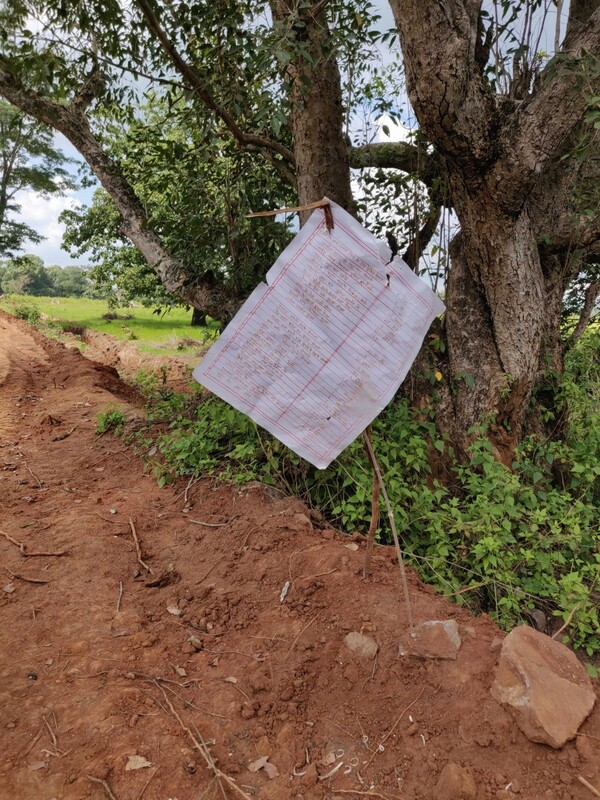 Posters protesting the upcoming election has been put up across several villages in Dantewada. At Potali, over 3,500 men and women had gathered. A separate section of young men and women – either wearing red uniforms or a red band around their wrists and foreheads – had gathered separately. 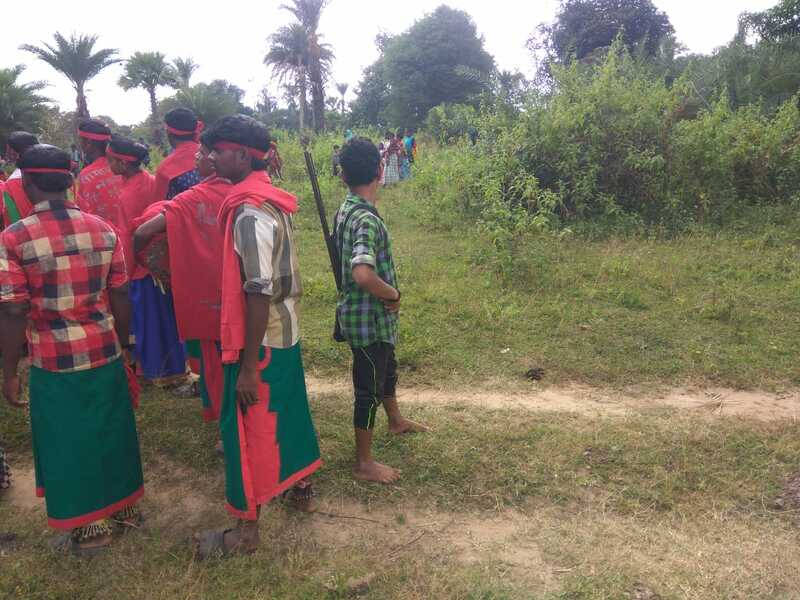 There was also a separate group of youth dressed in their traditional Adivasi attire, singing “songs of revolution” in Gondi language. This group, one of them claimed, was the “CNM party”. The event, organised meticulously, went on for over four hours, as this reporter among others sat and listened to different rebel leaders speak. Armed men, carrying country-made rifles, had spread across the landscape, overseeing the evening’s activities closely. The situation was tactically managed, but it was evident that the villagers had barely any control over the situation, least of all the agency to either choose or reject such a gathering. Reporters were allowed to take pictures and videos during the evening gathering, but were warned against filming those carrying arms. Then came a two-hour rally, through different hamlets across the village, interspersed with slogans and traditional dances and ending at an open space in the middle of the village. “We don’t want roads, we want hospitals and schools,” roared a person gathered there in Gondi. “Modi sarkar chor hai (The Modi government is stealing),” said another in Hindi. Almost 90% of the village spoke Gondi. It is believed locally that those who manage to converse in Hindi or Telugu have been a part of the armed movement for several years and have learnt the languages from “outsiders”. 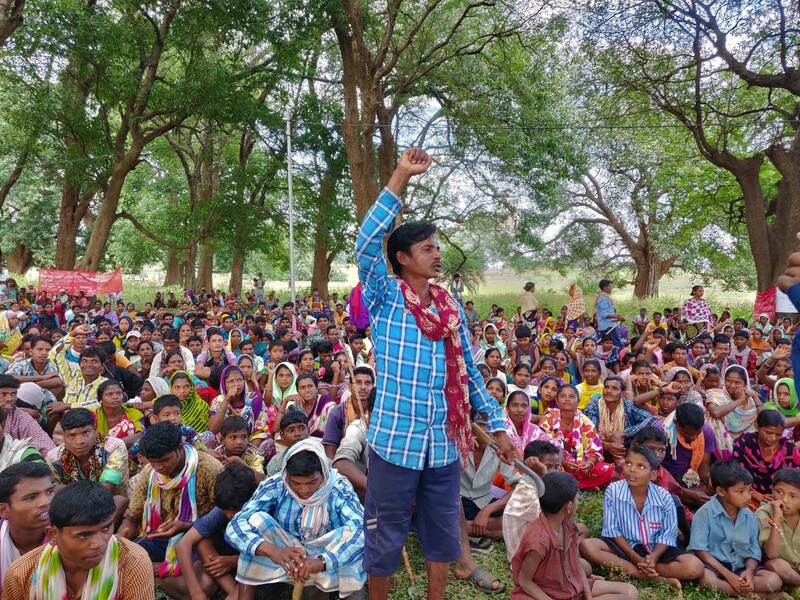 Members of Chetna Natya Mandli, a cultural wing of the banned CPI (Maoists) group, performs at Potali village in Dantewada as an armed member stands vigil. Around 4 pm, one person, barely in his 20s, entered the space and decided to speak to the reporters. He identified himself as ‘Gunda Dhur’ and we were later told that he is an “area commander”. This name is common – several armed men chose this assumed identity after a 20th-century Adivasi leader of the rebellion. Talking to this reporter, Gunda Dhur, who possessed an automatic rifle, claimed the reporter who was killed should not have travelled with the police. “Police se saath aaye yeh unki galti thi. Humne kissi patrakar ko yaha aane se mana nahi kiya hai. Lekin agar police ke saath aaoge toh maare hi jaoge (They had come with the police and that is their fault. We haven’t stopped any reporter from entering this space. But if you decide to travel with the police, you are bound to be attacked,” he said. 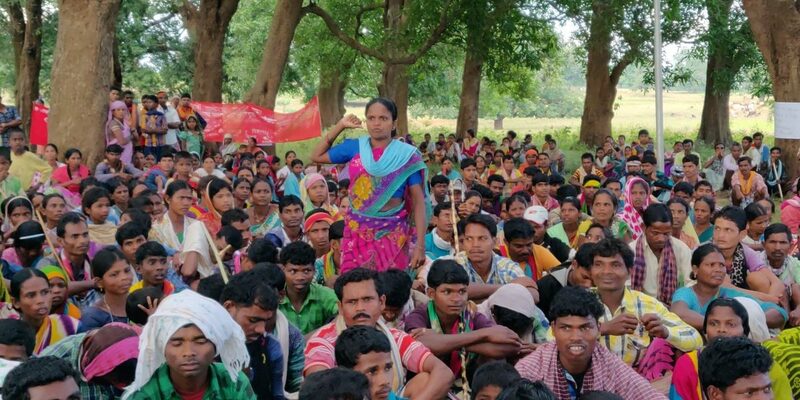 The Jan Manch (people’s gathering) organised by the banned CPI (Maoists) group on November 4 to protest the elections in Potali village in Dantewada. When asked if the men regretted having killed a reporter, Gunda Dhur said, “Yes.” But this expression of regret makes very little sense. This was not the first instance when a reporter was killed by the Naxals. They had reportedly killed journalists Sai Reddy and Nemi Chand Jain in 2013 after branding them police informers. Local reporters here have it difficult. They find themselves stuck in the cross-fire between the police and the Naxals. Harassment and intimidation is a way of life for Bastar-based journalists. He further took responsibility of having brutally attacked Nandlal Mudiyami, a member of Dantewada zila panchayat, at his house in Palnar village in Dantewada. Mudiyami, who suffered severe injuries to his skull and other parts of the body, is presently hospitalised at the government hospital, Raipur. He was reportedly attacked because of some alleged misappropriation of funds. Unlike their usual, signature style, the Naxals have not issued a public statement taking responsibility for the attack. Gunda Dhur claimed they will do so soon. “Jo jo jab jab bagawat karega, uska ek hi nyaay hoga,” one of the armed leaders claimed, hinting at death as the only “justice” possible for dissenters in the region. All images by Sukanya Shantha.